HARLEM — Stores that sell synthetic marijuana could lose their tobacco licenses or be shuttered as nuisances under proposed legislation designed to crackdown on sale of the drug, City Council Speaker Melissa Mark-Viverito said Tuesday. The sale of synthetic marijuana, also known under various street names such as K2 and Spice, was banned in the state and the city in 2012. But the penalty for being caught for peddling the drug is a minor violation. 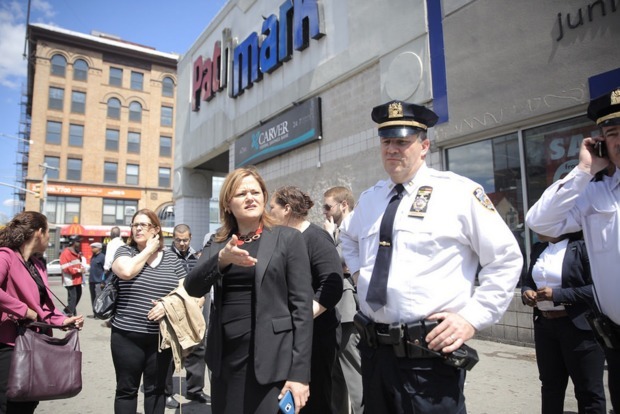 "There is a possibility of increased penalties but the possibility of also closing down those bodegas and stores that sell this product," said Mark-Viverito. "It's a growing problem." After noticing a spike in use in homeless shelters and an uptick in hospitalizations from the drug, Mark-Viverito called on the council to take action by adding criminal penalties. In April, the Department of Health found that there were 120 hospitalizations in one week from smoking a potent brand of synthetic marijuana called "Mr. Big Shot." Officials believe the epicenter of the problem is in East Harlem in the area of 125th Street and Lexington Avenue that Mark-Viverito represents as part of her district. "We're seeing, unfortunately, a surge of use of it in the homeless shelters for instance," said Mark-Viverito. "We are trying to get a handle on it. Now we are seeing it emerge in other parts of the city as well." More than 1,900 people were admitted to the emergency room throughout New York state from January to June 2015 after using the drug, state health officials have said. In July, a multi-agency inspection led to the discovery of 8,000 bags of synthetic marijuana at two East Harlem bodegas. Another inspection later the same month found 2,000 more bags. Part of the problem with policing synthetic marijuana is that the manufacturers routinely make changes to the chemical composition of the drug to avoid controlled substance laws. The new legislation will make it illegal to sell imitation synthetic drugs. The changing chemical composition and the cheap price of anywhere between $2 and $5, is leading to unpredictable reactions from users and overdoses, officials said. Under the proposed law, to be introduced next month, those caught selling synthetic marijuana or an imitation drug would face up to a year in jail and a $5,000 fine. Repeat violators face a $25,000 fine. Stores caught selling synthetic marijuana could also be considered nuisances and be shut down or lose their tobacco license. "This is becoming a very serious issue," Mark-Viverito said. "It's on the radar now of the city and we are taking aggressive action."